It is more important to keep the blade sharp, than whether your knives are inexpensive or very costly, so you need a high quality sharpening stone and proper instruction. 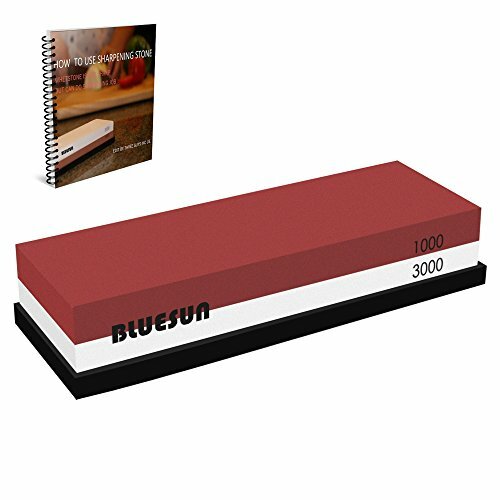 The BLUESUN Sharpening Stone is made of natural corundum, It has excellent features of self-sharpening, particle distribution is consistent and precise hardness, every Sharpening Stone is produced with 17 processes, which is grinded precisely and has three inspection procedures to guarantee the quality. A: Dominate hand is to maintain the proper angle of the blade, the opposite hand use 3 or 4 fingers to apply pressure, have the back of the blade lead the knife across the entire whetstone surface. B: works with one side at a time, once you feel a slight burr on the opposite side of the edge, then change side until you feel slight burr too, using short upward motion remove the burrs. C: when looking directly at the blade, you should see blade line. Step3:2000 grit is for honing, repeat the same way as above. *The cutting of knife tends to fold over with use, which make it dull, so honing is used, honing straightens the cutting edge of knife, and keeps knife working well before it is necessary to grind away material and re-profile the blade of cutting knife. *as you sharpening on 600 grit side, there will be small scratches and still burr ,so you can smoothing out scratches and remove burr with 2000 grit side, create a more polished, sharper edge. 2 GRIT SIDES ENSURE BEST SHARPENING: The BLUESUN Sharpening Stone Device has excellent features of self-sharpening, particle distribution is consistent and precise hardness. The 1000 grit side is for re-profile cutting edge of knife, refine the dull edge of blade and damaged gap of blade quickly, the 3000 grit side is for fine grinding, remove the burr and straighten the cutting edge of knives quickly, enhance the edge to be sharp and polished. HIGH QUALITY MATERIAL CAREFULLY SELECTED: The BLUESUN Sharpening Stone Device is made of natural corundum being fried with special formula by temperature of 1000+ Celsius inside industrial oven, and then cooled down by air dry. Every Sharpening Stone Device is produced with 17 processes, which is grinded precisely and has three inspection procedures to guarantee the quality. If you have any questions about this product by BLUESUN, contact us by completing and submitting the form below. If you are looking for a specif part number, please include it with your message.